Welcome to Episode 86 of The Alzheimer’s Podcast, where we’re all about bringing The Good Stuff (that’s respect, kindness, love, empathy, and compassion) for people living with dementia, their families, and the professionals who support them. I’m Christy Turner, AKA The Dementia Sherpa. I’ve enjoyed the privilege of working with over 1,500 people living with dementia and their families so far, including multiple experiences in my own family. For years, people living with dementia were diagnosed as “senile.” Over the years, that diagnosis evolved to things like “organic brain syndrome” or “senile dementia” or “senile dementia, Alzheimer’s type” (SDAT). For a while, in the not too distant past, it seemed everyone was given a “probable Alzheimer’s” diagnosis. Currently, most people I work with have a diagnosis of simply “dementia.” And while that can be helpful in a general sense, the larger problem with that is it doesn’t tell us what’s really going. For example, we’d expect someone with Alzheimer’s disease to have readily apparent problems with memory loss, whereas we know people with Dementia with Lewy Bodies may have more problems with hallucinations than memory. That brings me to Frontotemporal Degeneration, or FTD. Until recently, it was called Frontotemporal Dementia, and unfortunately I had a couple slips of the tongue during this upcoming episode, where I say Frontotemporal Dementia rather than Frontotemporal Degeneration. And the reason that distinction is important, just like the distinction between Alzheimer’s disease and Dementia with Lewy Bodies and plain old dementia or any other type or cause of dementia is because we want to be as accurate as possible. We want folks to understand that while each of these conditions may have some similarities–the features that allow them to all be grouped under the umbrella term “dementia”–they also have distinctly different features that require some different expectations and responses on our part. So, back to Frontotemporal Degeneration. We use that designation now because within FTD, there are various forms. Those include Primary Progressive Aphasia, or PPA for short; Progressive Supranuclear Palsy; Corticobasal Syndrome; as well as a form that is closely related to ALS, which itself is often referred to as Lou Gehrig’s disease in the US and Motorneuron disease in the UK. You can see how quickly this can get confusing. Meanwhile, all these variations focus on the degeneration of the frontal and temporal lobes of the brain, thus Frontotemporal Degeneration. Probably the best-known form of FTD is Behavioral Variant, or bv.FTD. Folks with bv.FTD have historically been misunderstood, mislabeled, and misdiagnosed. Hallmarks of bv.FTD can include significant behavioral changes, including behavior commonly associated with various types of compulsive or addictive behavior. As a result, people can lose their jobs, savings, marriages, cars, and homes before they ever even get a correct diagnosis. Given all that, it starts to become very clear why an accurate diagnosis is so important, right? That’s why I’m pleased to have Deborah Dolan on the show today. 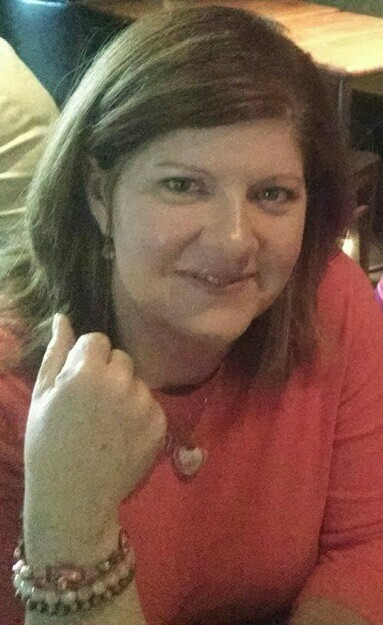 Deborah’s a volunteer with The Association for Frontotemporal Degeneration. She’s a retired geriatric care manager, and her husband Todd had bv.FTD. 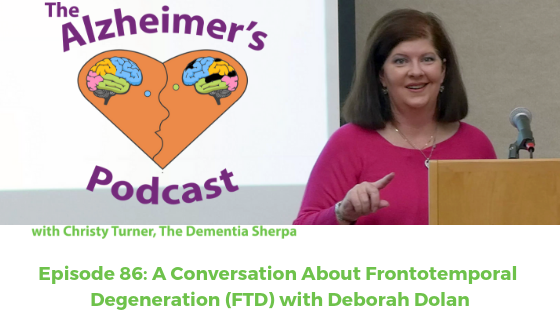 In this episode of Navigating Rough Terrain with the Dementia Sherpa, Deborah tells her and Todd’s story, including the challenges in getting a correct diagnosis and insights on care partnering with a person with bv.FTD. We also chat about the upcoming AFTD National Conference May 3, 2019 in Los Angeles, so stay tuned for episode 86 on The Alzheimer’s Podcast!